For a few weeks now, a Denver TV meteorologist would come home to find that something was invading her house, and eating her tortilla chips. You can see the amusing video of the sneaky squirrel heading through the doggy door here. In my squirrel research for this new blog, I came across a man named Robert who operates a squirrel cam in Alaska, and keeps a blog of the cam’s highlights. Now, you might ask: Why the need for a squirrel cam? Well, this is no ordinary cam — it’s a red squirrel cam. 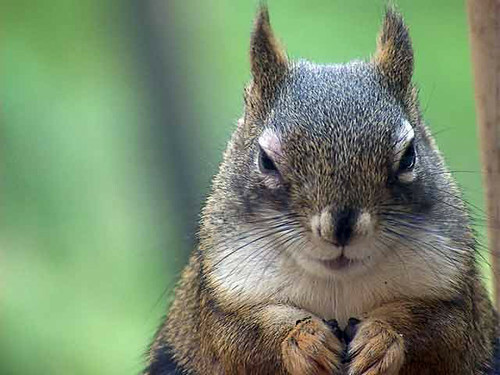 Even more so than their gray relatives, red squirrels are nutty, smart, cantankerous and hilarious. And they are also somewhat threatened in different parts of the world, primarily because the gray squirrel has taken over its territory. If you’ve ever gotten to know a red squirrel — and I did this summer at my in-law’s Wisconsin cabin — you know they are special little critters, and even more entertaining than gray squirrels. Robert has an extensive and, dare I say, breathtaking collection of red squirrel photos on his blog, web cam site and Flickr photo account: from which this photo is taken from.